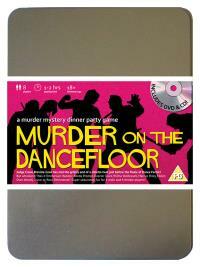 You've been invited to play the role of EILEEN OVER in Murder on the Dancefloor. It’s the eve of the final of Dance Factor and the competition is tighter than the male dancers’ leotards. Crane Breville Cowl decides to host a pre-final bash to relieve everyone’s tension and invites the finalists and his colleagues to come along, but all he gets for his troubles is a stiletto heel in the head. Join with us to find out who stepped on Crane’s parade! Judge (she looked in Crane’s lap for pointers!) Costume Suggestion : Dressed in a flattering designer suit with glasses you like to give the impression that you are a serious woman with serious authority. Your glasses allow you to get a better look at other judges’ scores to help with your decisions, and a pocket notebook allows you to jot down ideas when they come to you. Leave this empty. Your years of judging experience have given you an appreciation for the overall form of the dancer, so it’s especially exciting to watch Dazzler perform. It's probably no secret to anyone that you and Crane had become "special" friends and you're very upset about his sudden and tragic death.